Harnessing the power of nuclear fusion may require holding on to a little heat, about 100 million degrees Celsius (180 million degrees Fahrenheit) or so, but for a team out of the UK, it’s no big deal. 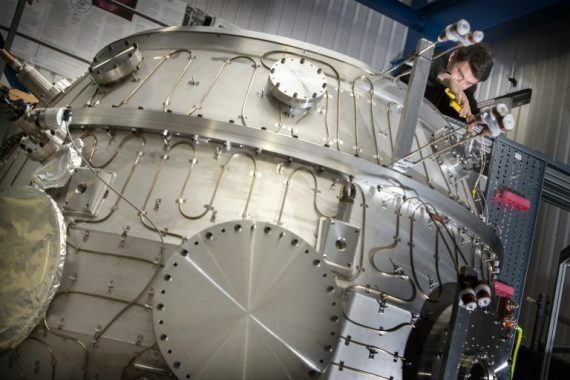 Tokamak Energy, a British energy company, has built a working fusion reactor which has the potential to heat plasma up to 100 million degrees Centigrade, which is about seven times hotter than the Sun’s core. Why so hot? At that temperature, hydrogen atoms begin to fuse into helium; the result is a massive surge of limitless clean energy. We are unveiling the first world-class controlled fusion device to have been designed, built and operated by a private venture. The ST40 is a machine that will show fusion temperatures – 100 million degrees – are possible in compact, cost-effective reactors. This will allow fusion power to be achieved in years, not decades. Current nuclear reactors use ‘fission,’ a process which generates energy by ripping atoms apart. Fusion, which occurs inside our Sun, is the process of fusing atoms together. Apart from a complex reactor, all that is really required is salt and water. Where our current fission reactors generate dangerous radioactive waste, fusion reactors produce harmless helium. Where things get tricky is the temperature; you literally need to contain the heat of a star. Kingham and his team’s ST40 reactor uses magnetic coils to control the heated plasma. The team has already created plasma using extreme heated conditions, and the next step is creating plasma at 15 million degrees Celsius. The mission is to slowly increase the temperature, hopefully achieving fusion by 2018. Assuming everything goes well, the reactor works, and doesn’t explode like a 100 million degree nuclear fusion bomb, Tokamak wants to power the entire UK power grid by 2030. However, they do have some stiff competition. A team from South Korea was able to contain plasma in a reactor at 300 degrees Celsius for roughly 70 seconds. MIT has also had some success with fusion, as well as a German team from the Max Planck Institute. The race for the future of energy is on, and fusion is very much the holy grail of clean energy. This whole limitless clean energy thing is cool, but I’m personally excited for the price of helium to drop since it’s just waste from our futuristic spaceman reactors.